The aftershocks of the August 12 crime and tragedy in Charlottesville continue to echo through Virginia and the nation. For the racist, xenophobic extremist politicians who set up the situation in that university town, the chickens may be coming home to roost. One of the key architects of the Charlottesville confrontation was the chairman-at-large of the Prince William Board of County Supervisors, Corey Stewart. He ran for governor in the Republican primary this year, basing his campaign on a xenophobic and racist appeal to the sector of the white population in this “purple” swing state to whom extreme nationalism, white supremacy, and a veneration of the symbols of the long dead Confederate States of America have strong mobilizing potential. The 3-2 vote of the Charlottesville City Council earlier last year to remove the statues of Confederate generals Robert E. Lee and Thomas “Stonewall” Jackson was seen by Stewart as an excellent opportunity to rouse his white supremacist base. Stewart hooked up with Jason Kessler, an open fascist who lives in Charlottesville and is active in extreme right politics there. Kessler is one of the leaders of the VDare, or Virginia Dare organization, an extremist anti-foreign and anti-Semitic group focused on what it sees as the illegitimacy of non-British racial and ethnic groups in the United States. It names itself for Virginia Dare, a child who was born to English settlers in Sir Walter Raleigh’s failed colony of Roanoke in the Outer Banks of what is now North Carolina. Virginia Dare was born in 1587, supposedly making her the first child of English parents to be born in North America. However, in 1590, another English expedition found that the colony had been completely abandoned, and to this day it is not known what happened to its people. Disease may have wiped them out, or they may have been absorbed into nearby Native American communities. At any rate, the mere birth of this one child is used by some right-wingers to question the legitimacy of the presence of other, non-English ethnic groups in what is now the United States. 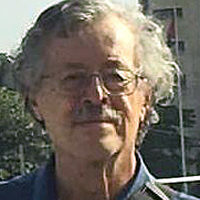 Kessler has set up an additional organization, Unity and Security for America, which emphasizes white supremacist and anti-immigrant themes, as well as calling for the elimination of “cultural Marxism.” When the Charlottesville City Council voted to remove the statues and rename the parks on which they stand, Kessler saw his opportunity to increase the visibility of his organizations and himself. 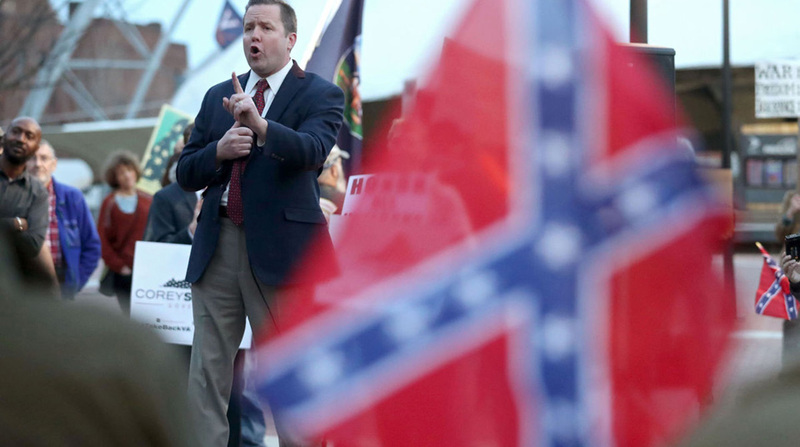 Though Kessler’s rhetoric is over the top, Corey Stewart was willing to share a podium with him in the lead-up to Charlottesville. This is typical of Stewart, who has made a point of appearing at, and endorsing, extremist Confederate-themed events. These are the people with whom Corey Stewart has deliberately chosen to associate himself. In his bid for the Republican nomination for governor, Stewart came shockingly close to beating an “establishment” candidate, party hack Ed Gillespie, with only 1.2 percentage points separating their vote totals. Gillespie, running against Democratic Party candidate Ralph Northam (the current lieutenant governor of Virginia) in the general election in November of this year, is now aping some of the anti-immigrant rhetoric that Stewart used to nearly beat him in the primary. Meanwhile, Stewart has announced that he is running against Senator Tim Kaine, D-Va., in next year’s federal midterm elections, and will no doubt use some of the same themes and tactics. If Stewart thinks he can use Prince William County as a springboard for ongoing racist and anti-immigrant politics, he may be mistaken. The county is about fifty percent minority (African-American, Latino, Asian, and other) in population. The Board of County Supervisors currently consists of two Democrats and six Republicans, including Stewart, which does not reflect the social composition of the county, whose politics are becoming more purple. In this year’s state elections, it is highly likely that the Republicans will lose some Prince William seats in the House of Delegates, the lower house of the state legislature. Hillary Clinton defeated Donald Trump in Prince William last year, by a healthy margin, even in Corey Stewart’s home base of Occoquan. Again in April, the Democrats scored a major victory in Prince William County, electing Jacqueline Smith as Clerk of the Circuit Court in a special election held to fill an unexpected vacancy caused by the death of the incumbent. Whether this will be a harbinger of more electoral victories for the Democrats is yet to be seen. The Republicans fear losses and, after gerrymandering state House and Senate districts, are intensifying their vote suppression efforts. But will the anger generated by Charlottesville bring out enough Democratic votes to defeat them? We shall see in November. But the effort to oust Corey Stewart from his county office may not have to wait until the next county elections in 2019.